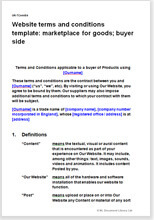 This website terms and conditions template sets out the relationship between your business and buyers who use your website to buy. The goods bought and sold could be anything. We have provided for basic contract procedures, but delivery information must come from the seller as they will not be the same for a tee shirt as for an item of industrial plant. Because each marketplace website has its own business model, we provide separate agreements for terms with buyers and sellers. You should therefore pair this document with the most suitable seller side marketplace T&C document we offer. See below. This template is for any website that creates a marketplace where goods are sold. It does not matter what type of experience that may be. Your site could connect buyers and sellers of small 'consumer' items such as rare coins or electrical homewares or large items used by businesses, such as cranes. sites that bring together retailers of different types of goods to offer a one-stop shopping experience to buyers (an online 'department' store where each retailer has a separate concession). has either regular sellers (for example, ones that operate their business from your site), or allows one-off sales. If buyers are required to subscribe (or become members) of your site before they can access the marketplace, then Website terms and conditions template: marketplace for goods; buyer subscribes for access should be the other document you need to complement this one. This template allows you to comply with the Contract and Commercial Law Act 2017, the Consumer Guarantees Act 1993 as amended, and other consumer protection legislation allowing your sellers to sell to businesses or consumers. This terms and conditions template includes provisions that cover both the relationship between the seller and the buyer and the relationship between your business and the buyer.